As volunteers, citizens and organizers of Freedom Balloon Fest, the all-volunteer team at Project Uplift USA is very excited about the multi-million dollar re-development of Fleming Loop Park now in progress in our Host Community of Fuquay-Varina. The Town of Fuquay-Varina and construction team are committed to completing this project in time for Memorial Day. From everything we’ve seen, we have nothing but confidence, they’ll be done with construction by end of March. Our understanding is that the construction plan is to have sod laid sometime in October, at the end of the growing season. Mother Nature will take care of the rest when the growing season kicks in next spring. The field and facilities should be ready in time for 2019 youth soccer and other similar field sports. We applaud the Town and construction team for their work to ensure this amazing park renovation will be finished in such a short period of time. In spite of this wonderfully executed plan, the Freedom Balloon Fest planning team has concerns about the probability for damage to newly laid sod on this otherwise completed project. The impact of foot traffic of Freedom Balloon Fest (typically 12,000-25,000 people per day not including set up time, vehicles, tents, and other required resources) is very different than typical youth sports events. Mother Nature just needs more time - a full growing season - for virgin sod to establish, settle and become more resilient. Naturally, we want to be good stewards of this revitalized park. We are all helping to pay for this construction project through our tax dollars. We’re not just volunteers, we’re taxpayers too. Thus, we have to balance our responsibility to the park with our desire to have Freedom Balloon Fest continue to grow and thrive in our Host Community. Simply put, we don’t want to damage a park we have worked so hard to promote and to bring so many from within hundreds of miles around to enjoy. As much as we want it, it’s not wise to have our big community gathering at Fleming Loop Park. What does this mean for Freedom Balloon Fest 2019 at Fleming Loop Park? We are currently brainstorming options for a temporary plan for Memorial Day weekend 2019, and we have discussed our concerns with the town’s leadership. Please stay tuned for updates as they become available. Above all, we hope you will all join us as we continue our mission to remember and to honor the past and present sacrifices of our military families. May we never forget. Project Uplift USA, Inc. is an all-volunteer 501(c)(3). One of its three missions is organize volunteers to manage and find donors to finance the annual Freedom Balloon Fest held during Memorial Day weekend. ​The festival is dedicated to the memory of those military who died in service to their country. Additionally, we recognize the sacrifice of all military families. As volunteers, we do these things in an effort to uplift our community and region with a spirit of gratitude and celebration for our freedom in our hearts. Fleming Loop Park is wide open space. It’s an ideal place to host a large festival like Freedom Balloon Fest. Almost everything required to make the festival come to life has to be donated, borrowed, rented or bought. Fortunately, we have an amazing Host Community with the Town of Fuquay-Varina. As previously noted, the Town provides critical public safety, fire, water and IT infrastructure services. As an all-volunteer organization, we have no full-time payroll. We do incur expenses for temporary security and off-duty law enforcement. Project Uplift USA is a Wake County-based, non-profit that hires local vendors wherever possible. We estimate greater than 85% of our vendors are from within Wake County and another 5-7% are from within the Triangle region. While Project Uplift USA has enjoyed strong support from local agencies, other non-profits, and corporate sponsors, our volunteers are working to increase grassroots donations in 2018. While the gift of 5,200+ man hours in 2017 from among more than 350 volunteers is likely the greatest measure of community support, we believe cash contributions from individual donors will signal greater awareness and understanding of our community messages and missions. In-Kind Services & Goods - Includes goods and services donated, which directly relieve expenses deemed critical to conduct the festival. Also includes certain discounts for portions of fees paid to certain vendors. Best efforts are made to calculate fair market value for in-kind contributions. 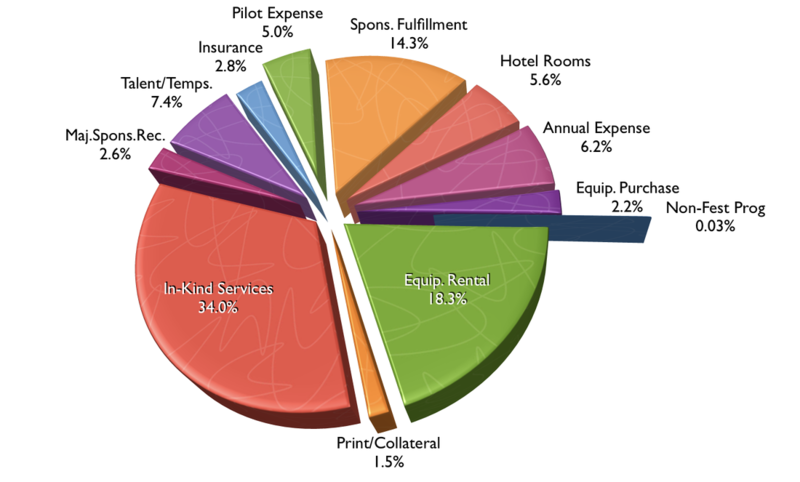 *2017 Expenses and carry-forward funds as of Oct 2017. Fuquay-Varina, N.C. – March 14, 2016 – The volunteer organizers of the WRAL Freedom Balloon Fest are pleased to announce Fidelity Bank as the presenting sponsor of the second community celebration dedicated to honoring the service of our nation's military families and remembering fallen heroes. "We are extremely pleased to be a part of such a worthwhile event. Fidelity Bank is helping to support our community by building a viable future where we live, work, and our customers call home,” said Fidelity Bank President and CEO, Mary Willis. “The WRAL Freedom Balloon Fest's core platform is to honor and celebrate the sacrifice of our military personnel and their families. This event embodies the spirit of service above self which we embrace in our Right By You mission as a community-centered bank." The announcement of Fidelity Bank's sponsorship is timed as the festival organizers launch a day-long volunteer drive at Fidelity’s Headquarters in Fuquay-Varina. "Being of service to others is deeply rooted within the Fidelity Bank culture," said Brian Hoyle, lead organizer for the WRAL Freedom Balloon Fest. "We believe the connection to volunteer service is in perfect alignment with Fidelity’s values. Like our volunteers, Fidelity Bank employees at every level truly want to help others. We feel it is the right way to celebrate Fidelity Bank's leadership level support, as we make a big push for volunteers. It's a great fit for our festival and for the community." Volunteers Wanted - Using attendance figures from last year’s event, the festival will require about 300 volunteers each day of the event. Organizers are planning for an audience of between 60,000-80,000 over the course of the festival. A variety of volunteer opportunities are available ranging from organizational and office skills to serving as hospitality volunteers and working with visiting balloon teams. The festival is looking to significantly grow the number of volunteers over the next two weeks and will have orientation and training meetings beginning in mid-April. Those wishing to serve as volunteers can do so at the festival's website: www.WRALFreedomBalloonFest.com. More than 30 balloon pilots and teams from around the nation are expected to attend the festival. Other entertainment includes vintage amusement rides, military displays, area merchants, arts and crafts village, dozens of different food options, and more than 19 hours of live music. The festival will officially open at 3:00 p.m. on Friday, May 27 through Memorial Day weekend. There will be an opening ceremony with a dedication of the Field of Flags living memorial space. About an hour before sunset there will be a mass ascension of all participating balloons followed by a balloon "glow" just after dark. Events in Fuquay-Varina continue on Saturday, Sunday and Monday mornings with competition balloon flights. 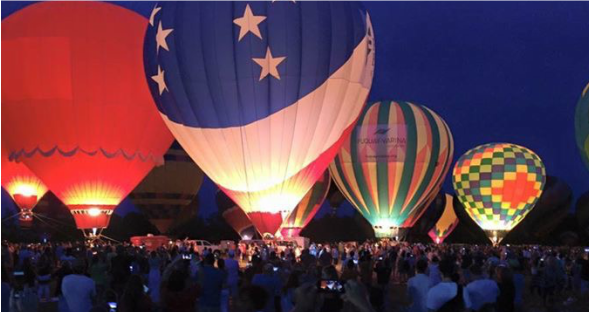 Each afternoon and evening spectators will enjoy a mass ascension and a balloon glow with a few of the balloons providing tethered rides. About The Fidelity Bank - Fidelity Bank is a full-service financial institution with assets of approximately $1.7 billion headquartered in Fuquay-Varina, North Carolina. The Bank owns and operates 60 branches throughout North Carolina and Virginia. About the WRAL Freedom Balloon Fest - This admission free community event is funded almost entirely through sponsorships and individual donors. It is organized by volunteers in humble recognition of the sacrifices and commitment to service exemplified by the men and women of our armed forces and their families. Together, we celebrate our freedom, remember our fallen, and honor those who serve and have served. "Project Uplift NC to Raise Spirits of Veterans, Children & Families Living with Mobility Challenges"
Hot Air Marketing, organizers of the WRAL Freedom Balloon Fest, announced today the launch of Project Uplift NC- a wheelchair accessible hot air balloon program funded through a sponsorship by the Raleigh Jaycees. The mission of Project Uplift NC is to provide greater access to a hot air balloon experience to those who may have mobility-related challenges due injuries sustained while in uniform. Funds provided by the Raleigh Jaycees will go toward fabrication of specially designed gondola featuring a clear, reinforced lexan sidewall that, when opened, offers ease of access to passengers. Traditional baskets require passengers to climb over sidewalls using a step hole or step ladder. “The leadership of the Raleigh Jaycees to undertake a program of this magnitude in honor of those who have given so much service to others is quite humbling.” said Hoyle. Project Uplift NC is a year-round, multi-year initiative. Beyond the scope of the WRAL Freedom Balloon Fest and serving military populations, Project Uplift NC will offer hot air balloon experiences to other populations living with mobility challenges, such as the elderly and children living with mobility related challenges. Those working with such populations are encouraged to reach out to Hot Air Marketing to schedule tethered balloon ride experiences or to provide on-going operational sponsorship funding. The Raleigh Junior Chamber, more commonly known as the Raleigh Jaycees, is a proud affiliate of the N.C. Junior Chamber, the U.S. Junior Chamber and Junior Chamber International. The Raleigh Jaycees are young professionals, ages 21-40, with an interest in leadership development through community service. Chartered in 1932, the Raleigh Jaycees is an all-volunteer civic organization that runs over 100 community service and leadership development projects each year - annually donating over $65,000 and countless volunteer hours to area organizations through various projects. More information about the Raleigh Jaycees and membership involvement opportunities is available at www.raleighjaycees.org. Freedom Balloon Fest is a free community event supported almost entirely through sponsors. The festival’s title sponsor is WRAL and Capitol Broadcasting Company, Inc. The core mission of the festival to celebrate of our nation’s freedom, to recognize the courage and dedication of our veterans, and to honor our fallen service men and women. Additionally, festival organizers are working to build greater awareness of the sport of hot air ballooning and to create an event that celebrates community engagement. The WRAL Freedom Balloon Fest is produced by Hot Air Marketing. Based in Raleigh, NC, Hot Air Marketing, LLC is an experiential marketing company, which utilizes the inspiring power of hot air balloons as a vehicle for connecting communities, consumers and brands. Old North State Catering is Cooking! We are pleased to announce Old North State Catering as the Official Catering Partner of the WRAL Freedom Balloon Fest. This means VIP treatment for everybody! Event attendees and our VIP guests at Bennett Bunn Plantation will be treated to the southern enhanced fare from a group that's fast becoming one of the Triangle's premier event catering companies - Old North State Catering. "We wanted to keep it good and keep it local," says event organizer and pilot Brian Hoyle. "As a family event with guests coming from all over, we wanted local, wholesome food our VIP guests would remember. When we found Old North State Catering, we found a unique partner who could also deliver great quality to the masses. It's a win-win for everyone. They've got major event experience, but you'll still be served by one of the owners. We are very happy to have Chris, Allison, Chef Joe and team taking care of everyone who comes out Bennett Bunn Plantation this Memorial Day weekend." Word is getting around about Old North State Catering. You may have tasted their award winning cuisines at community events such as Beericana (Holly Springs) and Savor Fuquay-Varina (winner, People's Choice and Viva la Difference Awards). ONS has received accolades from Cary Magazine's western Wake readers for the "Maggy" Awards. And, if you sampled the "fair favorite" bananas Foster at the 2014 NC State Fair, you've run into Old North State's alter ego the Rajun' Cajun. Freedom Balloon Fest is committed to "keeping it local." Old North State Catering was founded and operated by Fuquay-Varina natives Chris and Allison Wrenn who teamed up with their good friend and award-winning Executive Chef Joe Fasy. The team is active in the NC Department of Agriculture's Got To Be NC programs to use locally grown and raised products. And everything's prepped and cooked on-site in their 42 foot custom commercial kitchen trailer (award winning in its own right). So, come hungry to sample what Old North State Catering has cooking. Looking for a summer camp for your teenager that's got possibilities WAY above the rest? Organizers of the WRAL Freedom Balloon Fest are offering one area student a full scholarship to the Junior Balloonist Camp held at Millersville University in Millersville, PA from July 12-16, 2015. The Great Eastern Balloon Camp is organized by the Balloon Federation of America and run by its volunteer members. All counselors are FAA certificated pilots and experienced hot air balloon crew. The camp is open to students age 13-18 and previous ballooning experience is NOT required. The Great Eastern Balloon Camp is packed with information and hands-on experience with various hot air balloon systems and sizes. Camp experiences include information on rigging, tethering and pack-up, and interactive class sessions where campers will learn from professional pilots about: Crew Safety, Pilot Training, Weather, Airspace, Balloon Systems, Repair& Maintenance, Mapping & GPS, Career Exploration, Decision Making and MORE. Campers will learn what is important to pilots and crew, all while in a fun and safety oriented environment. The camp is only open to 20 campers, which means each camp participant will receive one-to-one, focused instruction and a "deep dive" into the world of the oldest form of human flight. The scholarship includes meals and housing in the secure campus dormitories at the University. When camp ends, campers will leave as a more valuable crew member, better prepared for becoming a safe pilot, and a chance for lasting friendships. The camp is centrally located near Philadelphia International, Harrisburg International and Millersville Airport. The scholarship does not include transportation to and from the camp, yet. Stay tuned - organizers are working to find underwriting for transportation for our lucky camper from the Raleigh area to Millersville and back through its Education & Outreach to Youth sponsors. ﻿Interested in becoming a sponsor? Let us know. Learn more about winning a Scholarship to Balloon Camp for your teen.